Any area of ground subject to pedestrian, animal or vehicular traffic is subject to erosion, prevention of which requires some sort of surface reinforcement. Traditionally, this has been done using Concrete, Tarmac or Block Paving. If a reinforcement system of some description is omitted, rutted, boggy, slippery and unsightly conditions occur which can be dangerous for all means of traffic. Hy-Tex Grass Mesh is robust, extruded, polyethylene meshes provide a discreet method to improve wear resistance and reinforce grass areas used by vehicles and/or pedestrians, whilst maintaining their appearance. This offers outdoor event organisers a practical method to preserve grassed parking areas and improve access and mobility. This high quality rubber moulded field mat is ideal for a stabilising outdoor ground cover. It is resistant to all weather conditions and maintenance free. 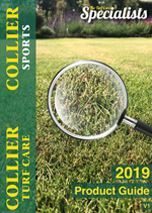 Get your grass peg ties through Collier Turf Care. Secure your outdoor field mats with our grass pegs and ties for a great value deal. Get grass pegs from Collier Turf Care and fix your field mats into the ground easily and reliably, all for a great price.